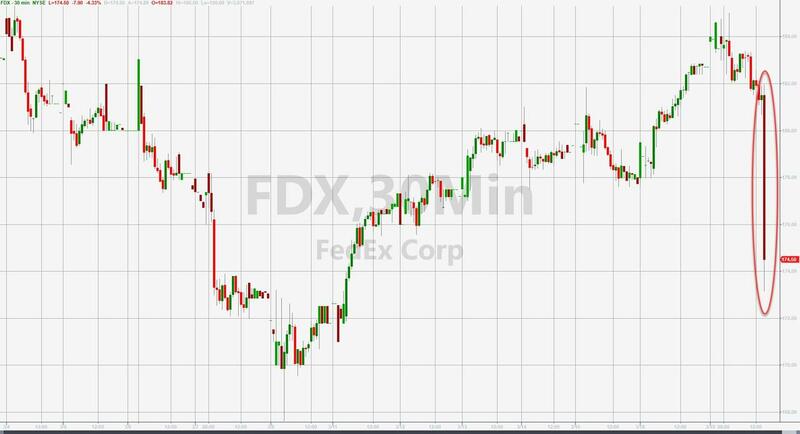 Belwether FedEx Tumbles Amid "Slowing Global Trade"
One quarter after Fedex shocked investors when it slashed its guidance to $15.50-$16.00, a move which Morgan Stanley called "jarring" and hinted at the possibility of a "severe recession" unfolding - the global belwether delivery giant did it again, when it cut its profit forecast for the second time in three months, citing weakness in foreign markets and a slowdown in trade, sending its stock tumbling 4.1% in post-market trading as 3Q adjusted EPS and revenue missed estimates. “Slowing international macroeconomic conditions and weaker global trade growth trends continue, as seen in the year-over-year decline in our FedEx Express international revenue,” said Alan B. Graf, Jr., FedEx Corp. executive vice president and chief financial officer. “Our third quarter financial results were below our expectations and we are focused on initiatives to improve our performance,” said Frederick W. Smith, FedEx Corp. chairman and chief executive officer. As a reminder, this additional weakness comes after FedEx slashed its earnings forecast last quarter, citing economic uncertainty in Europe and Asia. FedEx Express said it would not achieve its operating income goal of $1.5 billion by fiscal 2020.